​​length: 17 linear ft | diameter: 1/2" | emitter spacing: 7"
This dripline is drip-soaker technology that delivers water directly to the roots in a non-directional flow. It's a durable, flexible and easy to use dripline that is made from UV resistant polyethylene. In-line emitters are evenly spaced @ 7 inches apart along the dripline and can be run on the surface or covered in mulch for even less evaporation. A course has been designed for the dripline and landscape pins are included so that the instructed course can be permanently affixed. Use with a daily programmable timer for watering on days when you are not at home, on vacation, or too busy to water. 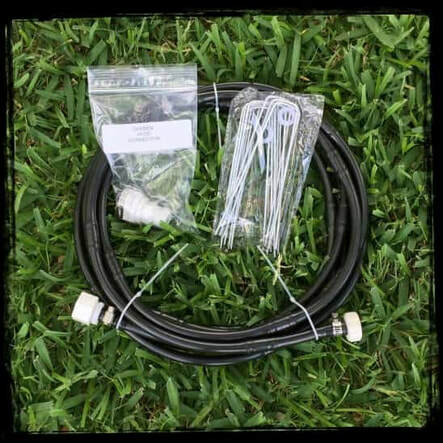 ​With this dripline you will use less water, achieve higher yields and make watering your Sendero, Huerto and Elevado Garden Beds a quick and easy process. ​Recommended operating range is 20 to 25 PSI, not to exceed that normal pressure.